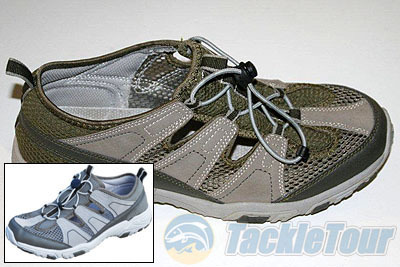 Introduction: Boating shoes have been around for some but what about fishing shoes? Like most bass anglers I just wear whatever is comfortable because there really hasn�t been a shoe designed with the features I have been looking for. 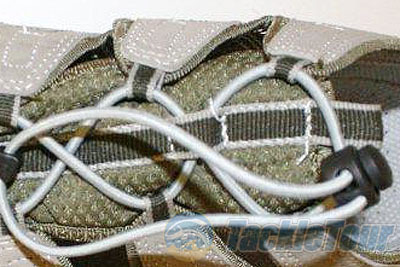 Recently several companies have started manufacturing shoes to meet the needs of the bass angler. Face it standing on one foot all day in the freezing cold or blazing heat takes its toll on you and your feet. 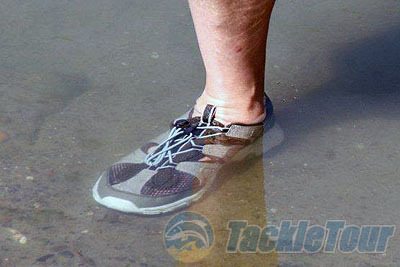 Then add in rough water, rain, slippery surfaces you really need a shoe designed for all the unexpected issues that arise when bass fishing. Each season requires a different shoe, warm boots in the winter, lightweight boots in the spring or fall then tennis shoes or sandals when its warm. 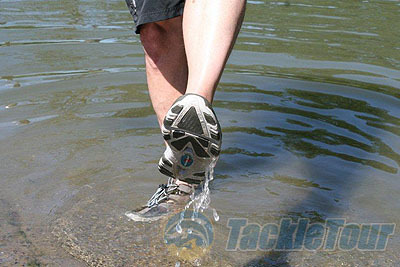 Toss tournament fishing into the mix and you�ll also need a shoe that is stylish, functional and comfortable. Add it all up and that is exactly where the Rugged Shark Laguna comes in. 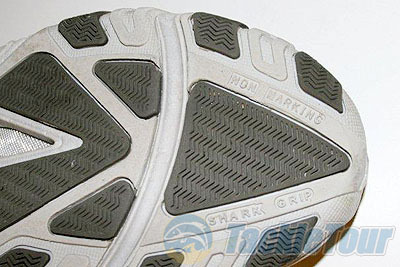 Impressions: Rugged Shark Laguna shoes are available in Grey only. (The shoes pictured here are an earlier version in green) I was impressed with the shoes stylish look, as many times functionality and style don�t seem to blend. The more I looked the more impressed I became, this is a shoe I felt good about wearing on and off the water. The shoe is easy to get on and off plus it�s very comfortable without socks. Field Tests: To test these shoes I wore them for a season while fishing both on weekends and competitively on bodies of water including the California Delta. We also did some extra testing by wearing the shoes on a wide array of surfaces including rocks, gravel, and even fully submerged in the Delta. Operation: Wearing the shoes while operating the foot operated trolling motor we noticed the flat sole and snug fitting upper made is easy to keep your balance. If you happen to get your feet wet while launching or a big cruiser pushed water over the side the shoes will drain rapidly and your feet don�t slip around much inside, a nice feature when you have to walk or operate a trolling motor with wet feet. 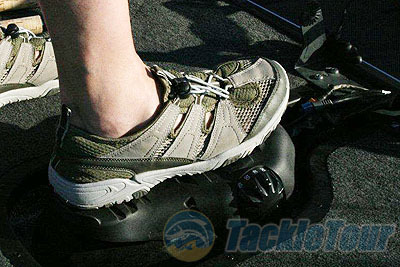 Comfort: Fishing shoes are becoming a more common item. To function correctly they need to be able to support your weight, provide traction, stability and all day comfort for your feet. When your feet hurt it makes your whole body ache. The Rugged Shark Laguna shoes features flexible fabric on the top section which increases comfort when paired with the flexible sole. I found the interior of the shoes smooth and free of any items poking into my feet, making them a pleasure to wear without socks. 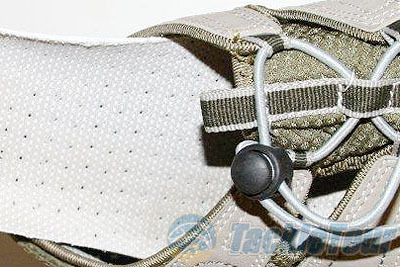 There is amble room in front of your toe and extra material providing a buffer just incase you stub your toe. This extra protection gives anglers extra confidence to move quickly in and out of the boat. Throughout the tests I found the Laguna shoes were comfortable to wear even when wet, and you don�t feel like your sloshing around in wet shoes, they dry quickly and provide comfortable grip at all times. 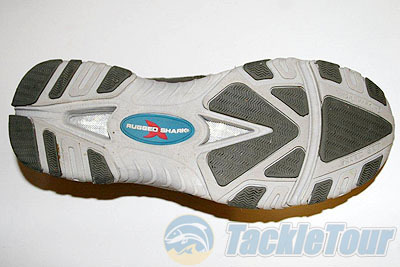 The Rugged Shark has a non-marking, non-slip sole. Protection: The Rugged Shark Laguna shoes provide comfort, style, and support all with a stylish design. Featuring vented sides, insert and soles the days of sloshing around in wet tennis shoes, slipping and marking the deck are over. Thanks to the combination of Ethylene vinyl acetate (EVA) and rubber soles the Laguna provides excellent traction wet or dry. Conclusion: I've always worn tennis shoes or sandals for fishing. With tennis shoes, when you find a comfortable pair they are not stable enough, or a flat stable pair is not comfortable. In addition you need to wear socks with tennis shoes, which are certainly not comfortable when wet. Sandals are a great option but I have had my feet burned several times and the soles are not very comfortable over the course of a long day on the water. I�ve found the Laguna comfortable, stylish and very functional, this is truly a shoe I can wear all day, all summer long.